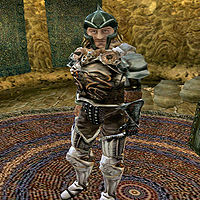 Turedus Talanian is an Imperial warrior and Lawman of House Telvanni located in Aryon's Chambers, Tel Vos. Talanian is chief of the mercenaries and personal bodyguard of Master Aryon. He is interested in building bridges to the local Ashlanders, the Zainab Tribe, by learning about the trade goods they desire. He will ask you to travel to their camp to find out the trade goods they want. He is wearing an Imperial dragonscale helm, Imperial chain pauldrons, a Nordic iron cuirass, an extremely rare daedric left gauntlet, and Imperial steel greaves with matching boots. He is also wearing an extravagant shirt and some expensive pants and he is wielding an ebony broadsword. Aside from his natural charm and ability to absorb fatigue from others, he knows no spells. "I'm %Name, chief of Master Aryon's mercenary guard. Providing for the prosperity of Tel Vos and the village of Vos is my trade. And, from the looks of you, adventuring is your trade. If you are an adventurer, would you be interested in a little work?" my trade: "I'm a warrior by trade, and an officer by training. I served in the Legions, and I know how to run a garrison. I know how to fight, and I know how to lead men. Master Aryon is a very original thinker, and I help him keep his feet on the ground." trade goods wanted: "When we know the trade goods wanted by the Zainab, we hope to engage them in trade as a step towards establishing better relations with them." "We've been trying to establish trade links with the Zainab. Master Aryon thinks that shared self-interest will make the Zainab more careful about offending Tel Vos. But dealing with the Zainab is tricky, requiring knowledge of the Ashlanders, a silver tongue, and sharp wits. I'll pay you 100 drakes to visit the Zainab camp and find out what goods the tribe would be interested in trading for. Will you take the job?" I'll take the job. : "Good. When you've determined the trade goods wanted by the Zainab, report back to me." No thanks. : "I'm sorry. Perhaps you'll reconsider. The offer stands." "Zainab camp is southwest of the village of Vos, near the foothills of Red Mountain. Here. Let me mark it on your map. Head southwest across the Grazelands until you strike the foothills, then head south, keeping the foothills on your right. When you pass the Dwemer ruins of Nchuleft on the western edge of the Grazelands, you'll cross an east-west road; Zainab Camp is eight or ten yurts east of the hills and south of that road." Talanian wrote the Telvanni-faction book The Affairs of Wizards. He is an Imperial "outlander" mercenary; due to a bug, he gives a stock response that is dismissive about "outlanders" and their attitude when asked about slavery. This is actually dialogue specifically for those Dunmer who are native to Vvardenfell, and will not otherwise be received except from them. This page was last modified on 26 April 2017, at 07:38.